The Dublin Pub is famous but none more than the Brazen Head. A very popular place to visit, while there enjoy great food, music and dancing. Ireland's oldest pub and that's a fact. The Dublin Pub is famous but none more than the Brazen Head,officially Ireland's oldest pub, dating back to 1198. While it is unclear how much of the original 11th century coach house is still intact, there is a palpable sense of history within these timeworn walls. 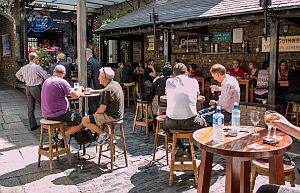 We are a short walk from Christchurch Cathedral and The Guinness Brewery, If you are looking for the true Irish pub experience then the Brazen Head Pub should be your first port of call. 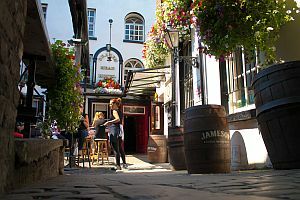 This Dublin pub has managed to retain the charm and characteristics of it's past and in particular it's patrons, who have included such literaries as James Joyce, Brendan Behan and Jonathan Swift as well as such revolutionaries as Robert Emmet, Wolfe Tone, Daniel O'Connell and Michael Collins. 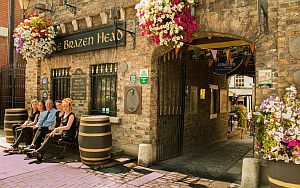 Considering places to visit in Dublin, then the Brazen Head has a well-deserved reputation for great food, serving both traditional and contemporary dishes. Food is served every day from 11.30am to 9.30pm. Famed for our traditional stews of Beef & Guinness and Irish stew, these hearty dishes combine all the ingredients in one bowl. For seafood lovers we offer a wide variety of delicious seafood dishes including steamed Irish mussels, smoked salmon, and melt-in-the-mouth fresh cod encased in our very special beer batter. 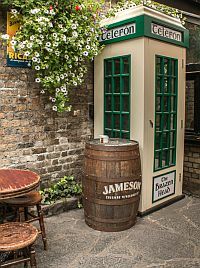 While at the Brazen Head, just a throw stone away is The Guinness Storehouse, Christ Church Cathedral, Dublina Exhibition, The Jameson Distillery, St Patricks Cathedral , Irish Museum of Modern Art and much more.